I'm grateful that every Friday an educator or an author/illustrator agrees to complete my sentence starters. I am inspired and impressed by the angle each participant takes. Author Mara Rockliff is the Star of the Week. I wrote the words in red, and she wrote the words in black. Thank you, Mara! 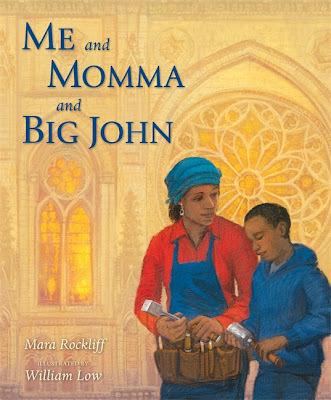 Me and Momma and Big John is a book about community. Or family. Or architecture. Or the question “What is art?” Or city life. Or pride. Or work. Or history. Or what women can do. Everyone who reads it seems to see a different Big Idea in it, which is great! A funny thing about this book, which takes place in New York City, is that none of the New York publishers wanted to publish it. They all thought it would only interest people in New York. It took a Boston-area publisher, Candlewick Press, to see that this story was about much more than just a local landmark. 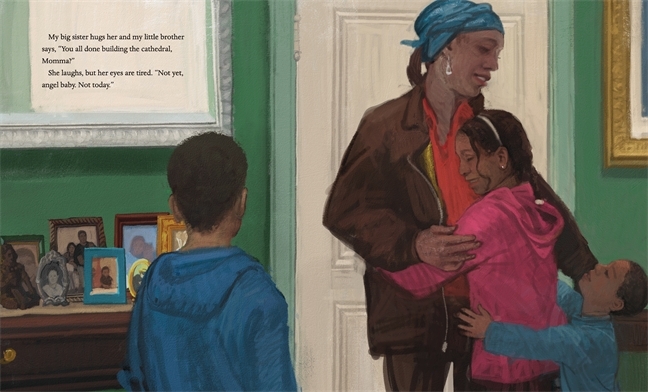 That kind of vision is what makes Candlewick so good. The Cathedral of St. John the Divine had fish tanks in one of its chapels the first time I visited, more than thirty years ago. (I was in sixth grade.) I hadn’t been in very many churches—my family is Jewish—but when I saw those tropical fish swimming around, I knew this was my kind of church. Full of surprises! William Low’s illustrations look just like paintings, but they were made on a computer! * Aren’t they beautiful? I love the way he shows the sunlight streaming through stained glass, and also the picture at the very end of the book, showing the cathedral at sunset. When I met William** and told him that last illustration was my favorite, he gave me a signed print as a gift! Super, super nice guy. **A lot of people don’t realize that a book’s author and illustrator work separately and may not even know each other. Some illustrators, like William, I didn’t get to meet until after our book came out. Others I’ve never met at all! I wrote My Heart Will Not Sit Down in 2005! And it came out SEVEN YEARS LATER. Can you believe that? When I wrote it, your fourth graders were tiny toddlers! (In fact, my daughter is in fourth grade this year and when I wrote it she was two years old.) Sometimes books take a REALLY long time to be published, especially picture books. But I love that story, because I just think it’s so amazing that people in a village in Africa would care about helping strangers in a distant, unknown land—America. Picture books are kind of like cathedrals, actually! More than any other kind of book, a picture book is made by a whole bunch of people with different skills working together— not just the author and the illustrator, but the editor, the copyeditor, the design team, and lots of other folks I never even see. And just like a cathedral, a picture book isn’t the kind of art you’re just supposed to stand and look at and admire. It’s meant to be used and shared. 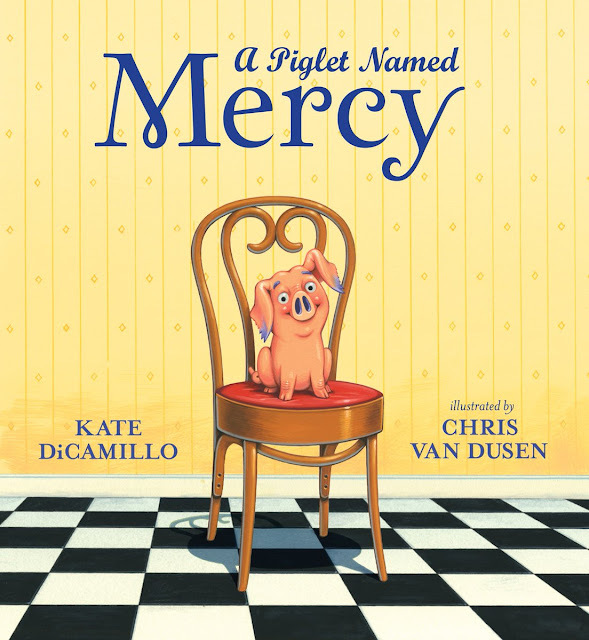 Whether you’re reading aloud to a class of thirty or one little kid in your lap, picture books are all about communion. Reading is like walking and eating. I have to do it every day or I get grumpy. Mr. Schu, you should have asked me about my super-secret identity, because I’m not just Mara Rockliff—I’m also Lewis B. Montgomery, author of The Milo & Jazz Mysteries series. I took my pen name from the authors of three of my favorite books: The Lion, the Witch, and the Wardrobe; Charlotte’s Web; and Anne of Green Gables. Knowing how much you love books, Mr. Schu, I bet you won’t have to look up those authors’ names! I am giving away one copy of Me and Momma and Big John. 1. It will run from November 9 to 11:59 p.m. on November 12. 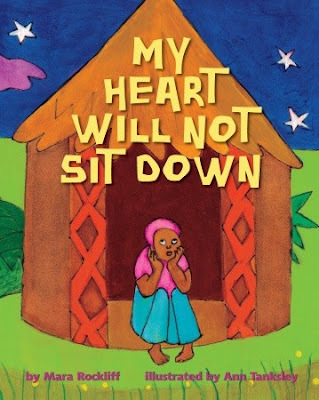 Borrow Mara's picture books from your school or public library. Whenever possible, please support independent bookshops.